“What are those fluffy white animals that you see on a farm, and why do we have them?” This was the question we asked around sixty kindergartners from in Columbus, Mississippi, on March 11, 2016. Our main project for our Animal and Dairy Sciences senior capstone class was to design and create an “activity box” to teach children about a specific farm animal and why they are significant to the world. Based on our experience with different animals, our group was assigned the animal we had the least experience working with – sheep. Finding a time for five seniors to all meet up and develop our prop box proved to be difficult; so, our group strategy for the county prop box project was to divide and conquer. We split up the task evenly so everyone had a job to do. Therefore, our “prop box” consisted of five sections: an introductory “Q & A” about sheep and why we have them, a herding activity, a shearing activity, a “feel box”, and a take-home sheep activity book. The introduction included basic information about sheep with a few pictures, and we gave each child their own sheep to use for the subsequent activities (the “sheep” were balloons with faces drawn on them). For the herding activity, the children used shepherd’s canes to herd their “sheep” into a “feeding pen” in a relay-race fashion; and once the sheep were all herded, we informed the children about different forms of feed that they could give to their sheep. After all the sheep were “fed”, the children brought their sheep over to be sheared. For this activity, we placed shaving cream on each child’s balloon sheep to simulate wool; the children then used a tongue depressor to “shear” their sheep. Following the release of the sheep back into the pasture after shearing, the young students were able to participate in a “feel box” activity. The “feel box” was a shoe box with a hole cut into three of the sides with a curtain over each hole so that one could not peek inside. Each separated portion of the shoe box contained a different material: silk, cotton, or wool. After having felt inside each compartment, the children would guess which hole contained the wool before we opened the shoe box to reveal the materials inside. As we prepare to do a similar activity for the upcoming “Afternoon on the Farm,” we hope to be able to use live sheep in our presentation. After the response we received from the balloon sheep, we believe it will really help the students to be able to see and feel a live sheep (with real wool) while we teach them about these fluffy farm creatures. This was an incredible experience for our group. A much different understanding comes from teaching students rather than always being taught. We had fun enlightening these young children about a part of agriculture that they may have never been able to learn much about, and we were cheerful that the students were excited to learn about the importance of sheep and had fun in the process. Note: This blog post was written by a group of students in the Capstone in Animal and Dairy Sciences course, who were assigned to work with youth in a neighboring county to teach them about dairy cattle. presentation aimed at teaching Junior 4-H kids about the dairy industry. Our first step was to have a group meeting to discuss which areas we wanted to highlight to the students. We wrote out different activity ideas and decided on the ones we liked best. We had hands-on activities to explain the topics of dairy products, feeds, the milking process, and identification. We split the group up in order for each member to more specifically focus on a section of the project. This allowed for a more developed presentation. hour teaching them about our semester’s work. They all had a fantastic time learning to milk a cow and seeing that chocolate milk does not come from a brown cow. They were able to learn about the weight of a gallon of milk and the importance of a variety of feedstuffs. Since there were so many students, we were not able to have one on one time, however the multitude of parents helped to keep the kids focused and attentive. At the end of the night, we were showered with questions from both students and adults alike. Each child went home with a simulated ration made out of different types of candy. Overall, the majority of the group was very attentive and responsible for their sections of the presentation. We enjoyed the project and learning how to interact with students on their level while still teaching them something new. The experience as a whole was interesting and positive. Note: This blog post was written by a group of students in the Capstone in Animal and Dairy Sciences course, who were assigned to work with youth in a neighboring county to teach them about pigs. tasked with teaching 6 cloverbud students all about pigs in a manner that targeted their interests and attention level. With such a small group, we were able to give one on one attention during each of our 3 activities. We had an amazing time getting to know the students and teaching them about an industry that affects everyday life. Though the kids enjoyed all the activities, they were particularly fond of playing in the simulated mud. We had an abundance of questions and interaction between the students and their parents, as well as with us. Each child had an area that they were more familiar with, however everyone left with new knowledge. At the end of the presentation, each student took home a bag of mud, a separate bag of bacon and pepperonis, a pig head cut out used for ear notching identification, and a mobile that showed multiple products obtained from pigs. Our strategy for this presentation was to break down the activities into 3 main sections. We had product, nutrition/health, and identification sections with a hands on activity attached to each. Since we had 6 members in our group, we split and had 2 “teachers” per activity. We had group meetings to discuss each activity and to gather supplies. Every person worked diligently to develop their part of the presentation thoroughly. Overall, the entire group was pleased with our progress and deem this presentation a major success. Our capstone group was assigned beef cattle for our topic and Webster County for our presentation location. We had several activities planned for the Cloverbuds, ages 4-8. We first briefly explained the difference between beef and dairy cows. We then showed them the basic parts of the cow on a poster we had made and pictures of different breeds. We then went over the history and purpose of branding and had them make their own brands with pipe cleaners. They then stamped their pipe cleaners on a cow outline with paint to “brand” their cows. Next, we had them make puppets and “tagged” the puppets’ ears with a hole punch, while we explained the reason for ear tagging. We also passed around a real brand and samples of feed for them to examine. There was an education graduate student present that asked the children questions before and after our activities. It was evident that the children grasped the concepts presented in the lecture, as they were all able to easily answer her questions. All of our activities were very hands-on based, which we feel made the children better able to pay attention and learn from the experience. The youth were very well behaved and responsive to us. They were eager to do all of the activities and seemed to enjoy themselves. Our group had a fun time participating in this project with the 4H children of Webster County. Note: This blog post was written by a group of students in the Capstone in Animal and Dairy Sciences course, who were assigned to work with a local livestock producer to solve a production challenge. Our producer is an experienced and savvy cattleman. This much was apparent when our group first met with him in August to discuss the challenge he presented to us. He runs a beef cattle operation that specializes in Red Angus and Fleckvieh Simmental seed stock animals. The producer asked our group to take a 175 acre parcel of land and develop a rotational forage plan. The goal was for the land to produce enough forage for the animals to graze off of as well extra forage to store as hay for the winter months. Overall, the producer was looking for 13 months worth of forage to maintain his animals. Our group started with questions galore. At first, every answer we found seemed to lead us to more questions. We explored every aspect of the challenge we could think of. We delved into soil types, forage types, nitrogen supplementation, animal requirements based off of mode of production, and much more. With the invaluable help of Dr. David Lang of the Department of Plant and Soil Sciences, our group was able to sift through the information we had gathered about the land and its carrying capacity. After hours spent over spreadsheets full of calculations and countless maps of the land, our group developed a forage plan that suited the specific needs of the producer’s cattle as they move through different phases of production throughout each year. Our group is grateful to have had the opportunity to work with our producer and expand our knowledge in several aspects of animal agriculture. This forage plan challenge has allowed us to apply the knowledge we gained in a real-world setting. The project has also taught us about where to look for answers should we not know the answer immediately. We, as Animal Science students, feel equipped with the knowledge necessary to enter the world of animal agriculture. genetic markers that compared to other female cattle that were at least 50% Angus. We were able to look at three specific sections of their DNA that were categorized into growth traits (such as birth weight), maternal traits (such as milk production), and profit traits (how much money the cow will be worth as an adult and how much her offspring would be worth). We analyzed the information from the GMX Advantage to make our decision. Our group began this process by culling heifers whose average trait values were less than 50 (each trait is given on a 100-point scale). Culling these heifers allowed us to keep better genetics in the herd. Next, we utilized peer reviewed articles to broaden our understanding of replacement heifers and genetic selection. Finishing our challenge, we will now compile all our data and results to present to our producer. We used the knowledge gained through our previous classes in the Animal and Dairy Science Department and personal experiences to make our decision and solve our producer’s challenge. “And on the 8th day, God looked down on his planned paradise and said ‘I need a caretaker’ so God made a farmer.” In 2014, our partner woke his wife in the middle of the night and told her of his dream to become a farmer. Since then, his dream has slowly become reality as his pasture pig operation has hit the ground running, literally. In all start-up businesses there are going to be obstacles, especially when animal agriculture is involved. Our producer has requested the help from Mississippi State University to address some of their farms challenges in terms of nutrition. The farm’s objective is to raise hogs from birth and finish them out at a reasonable market weight. Based on the niche market in which this farm operates, the diet and management of the herd differs compared to common hog production guidelines. Our primary objective is to create multiple rations for this herd using alternative feedstuffs. In order to not only maintain the body condition of the animals based on their own requirements, but to reduce overall cost of feed and improve upon their management practices. To do this, we have used resources provided through the university, faculty, and extension service, as well as literature from the Journal of Animal Science. We have developed a framework of both short and long-term modifications to implement as needed. Such as adding infrastructure, harvesting crops, processing feeds, and breeding techniques. We are grateful for this opportunity to interact with the community and local producers in agriculture. Not only have we been able to help and educate others, but we, as students, have learned a lot along the way. Our partner has challenged our group of MSU Animal & Dairy Science students to prepare a plan for him to begin a cow-calf beef operation. With 20 acres of land available, our producer wants to start with 7-10 Red Angus heifers. This challenge is important to our producer because he wants to successfully enter into the beef industry. For many years, he wanted to start his own operation but never knew where to begin due to a lack of knowledge about the industry. He is now ready to step into the industry as a proud Red Angus beef producer. This challenge, if successfully completed by our group, should allow him to begin his operation with confidence and success. Our group has many tasks to complete in order to obtain all the needed information. We have already visited our producer’s farm to assess his property and learn about his general goals for his operation. Our next step will be to calculate the initial investment cost for our partner to begin his operation. These costs will include the purchase of the heifers, feed (grain and hay), any repairs needed on his fencing, a tractor and trailer, water troughs, vaccinations, and dewormer. We will need to determine what types of forages he has on his property so we can decide if these forages should be kept or replaced with a different forage variety of better quality. With his limited space, we have decided that rotational grazing will be most useful for our producer’s operation. Our producer prefers to utilize natural breeding, rather than artificial insemination, and hopes to purchase a Red Angus bull. We will need to calculate the costs and benefits of this type of breeding for his operation. Through this process, our group is learning that starting a cow-calf operation is neither easy nor cheap, and that it requires a substantial amount of money, time, and planning to create a successful operation. 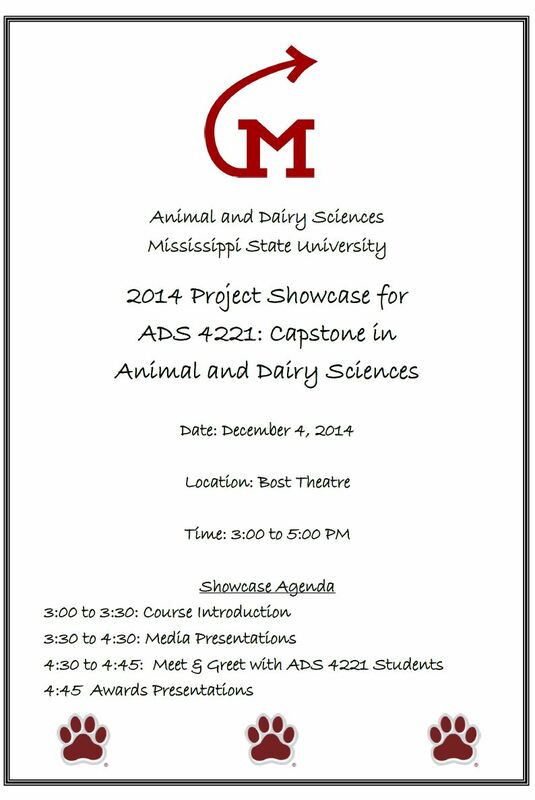 Make plans to join us Thursday afternoon for our ADS 4221: Capstone in Animal and Dairy Sciences Project Showcase! STARKVILLE, MS- Recently the question, “What does 4-H bring to our youths’ development?” has become popular. Uniformed individuals often have the false belief that 4-H “desensitizes” children to the mistreatment of animals, which is far from the truth. Two sheep at a local producer’s farm in Oktibbeha County. A more appropriate term for the efforts of 4-H is education, not desensitization. 4-H promotes responsible animal husbandry and ethical treatment of animals. It also promotes the consumption of locally sourced, fresh products that are very rarely seen in supermarkets. “Without an interest in agriculture from our youth, how will our society obtain food in the future when the current farmers are aged out of this industry?” questioned Andrea Seitz, a fourth year Animal and Dairy Science student at Mississippi State University. In light of the agricultural generation gap, now, more than ever, there is a need for educating the younger men and women of this country on the importance of being involved in agriculture. Because of 4-H, the youth across our nation are steadily gaining skills, knowledge, and hands-on experience in the agricultural field. When asked about his experience with 4-H that has turned into a sheep producing business, Will Christiansen stated, “I’d like to keep raising [sheep] and pass it on to other people so they can have the same opportunities that I had”. Will Christiansen looking after his sheep.